Hearts, flags, skulls, women's figures and phrases are all things that can be turned into permanent artwork on your body - if you can put up with the pain and think you want to live with it forever. When Bikers attend the Sturgis Rally this year, many of them will be looking for Morris Zeise. At German tattoo artist, Morris began working in his profession in 1992, and in 18 years has become known as one of the best in the world. 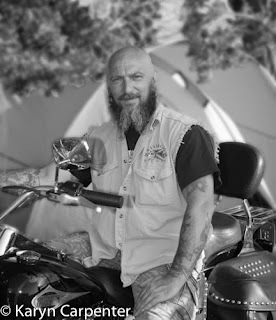 in 2003 he attended the Sturgis Bike Rally as an exhibitor and has returned every year since. "It's just fun," says Morris, who keeps a Harley stored with a friend who lives in the Kansas City area so that he has one for the big event. "There is nothing like this in Europe," says Ziese, who rents a storefront location for the two week Sturgis event. "There is a rally in Austria that draws 50,000 to 70,000 biking enthusiasts, but it is not like Sturgis. There is nothing like this in the world." When asked if he could turn anything into a tattoo, he at first said, yes, then looked at Arayo. "You mean her," he asked? "I did a black dog once before but there isn't enough detail. All the black just runs together. It wouldn't turn out well." he admitted. Guess I'll be tattooless for another few years! A Newf may not be a good subject for a tattoo, but I have very cute, colorful paw prints tattooed on my foot- hardly even hurt!